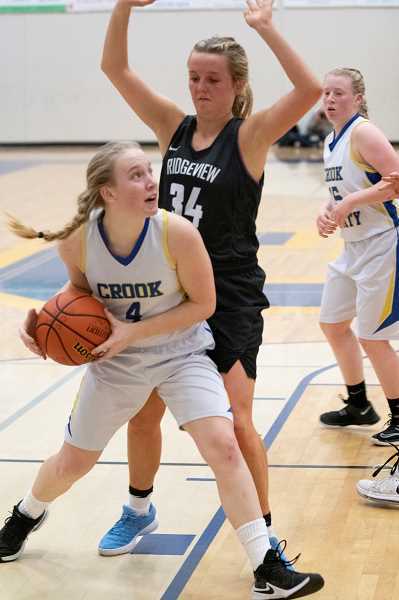 The Crook County Cowgirls played probably their best half of basketball all year, but it wasn't enough as the Ridgeview Ravens pulled away in the second half to take a 55-32 victory over the Cowgirls in Intermountain Conference action. The visiting Ravens jumped out to an early 9-0 lead. However, despite playing without leading rebounder and scorer Liz Barker, who was out with an ankle injury, the Cowgirls were able to slowly work their way back into the ball game. "Our posts did a great job," Crook County head coach Heidi Lea said. "Both Josie Kasberger and Heather Ptomey did a great job." Crook County trailed just 11-5 at the end of the first quarter. Ridgeview post Rylee Troutman picked up her third foul midway through the second quarter, and the Cowgirls took advantage, outscoring the Ravens 10-9 in the second period as they went into the locker room at the half trailing just 20-15. When Dallas Hutchins hit a two early in the third quarter, the Cowgirls were down just three points at 20-17. However, the Cowgirls were unable to keep up with the Ravens the remainder of the quarter as Ridgeview outscored Crook County 20-5 to take a 40-22 lead at the end of the period. The two teams played even for most of the fourth quarter, but it didn't matter as the Ravens had already taken control of the game. "They battled," Lea said. "They did some things well. We just get timid, and they had that run where we don't attack and don't look to shoot and suddenly it's an 18-point ballgame instead of a 5-point ballgame. The first half I thought the girls did an awesome job. And then they went on a run." Troutman overcame her early foul problems to lead all players in scoring with 13. Alaina Clark was also in double figures for the Ravens with 12. Josie Kasberger led the Cowgirls in scoring with 12 points, while Dallas Hutchins added seven. "We played really good in the first half," Kasberger said. "We did a lot better with their full-court press than we have done in previous games. And we have been working on moving the ball a lot on offense this week, and it really paid off." The Cowgirls did the best job they have done all year taking care of the ball, committing just 16 turnovers, the same as Ridgeview. The two teams were nearly even on the boards as well with the taller Ravens pulling down 38 rebounds to 37 for the Cowgirls. Hutchins led all rebounders with 10, while Kasberger pulled down nine. Troutman led the Ravens in rebounding with eight. However, the Ravens did a better job of making shots, going 21-67 from the floor for 31 percent to the Cowgirls 14-52 or 26 percent. In addition, Ridgeview hit 13 of 20 free throws, while the Cowgirls went just 3-19 from the charity stripe. Still, Lea was pleased with what she saw from her team. "It's great," Lea said. "Our young kids are stepping up. I thought to play Ridgeview even in the first half, I was excited. They stayed and battled up until that run in the third quarter." With the victory, the Ravens improved to 1-1 in conference play and 6-10 overall, while Crook County fell to 0-3 and 1-13 overall. 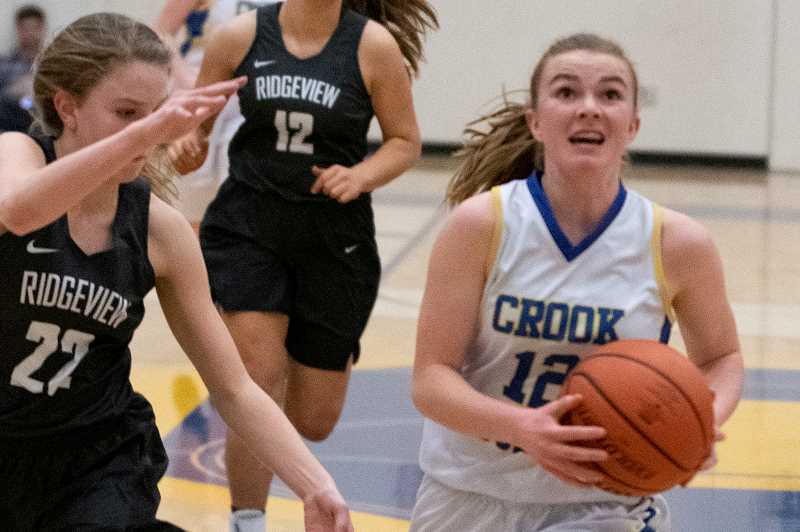 Crook County is scheduled to host Hood River Valley (0-3, 2-15) on Friday, Feb. 1, while Ridgeview is at The Dalles, (1-2, 7-7). Crook County – Josie Kasberger 12, Hutchins 7, Freeman 5, Mode 3, Woodward 2, Ossenkop 2, Brooks 1, Guthrie, Ptomey, Rash, McClellan. Totals: 14 3-19 32. Three-point goals – Ridgeview: none. Crook County: Freeman.